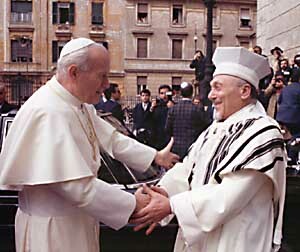 The mission/objective to the Office of Ecumenical and Interreligious Affairs is to facilitate both ecumenical (inter-Christian) and interreligious (Jewish-Catholic, Muslim-Catholic, et al.) relations of the Archdiocese of Philadelphia. The targeted audience is non-Christian religious communities and organizations as well as Christian churches, ecumenical agencies, institutes and centers. The Archdiocese of Philadelphia co-sponsors the Youth Symposium on the Holocaust with the Jewish Federation of Greater Philadelphia. The Youth Symposium has taken place in each year at four local universities during their spring break. The Archdiocese collaborates with the Memorial Committee for Six Million Jewish Martyrs in the annaul Yizkor ceremony in memory of the Jews martyrs and heros of the Holocaust. The Archdiocese works together with the Jewish Federation to encourage all Philadelphia-area middle school and high school students to learn about and reflect upon the history of the Holocaust through participation in the annual Mordechai Anielewicz Creative Arts Competition. The Archdiocese partners with Anti-Defamation League to provide professional development for Catholic School teachers in the Bearing Witness™—Anti-Semitism, the Holocaust and Contemporary Issues. The office relates to the people of the Archdiocese in educating them in ecumenical and interreligious affairs and encouraging them to participate locally in the same.